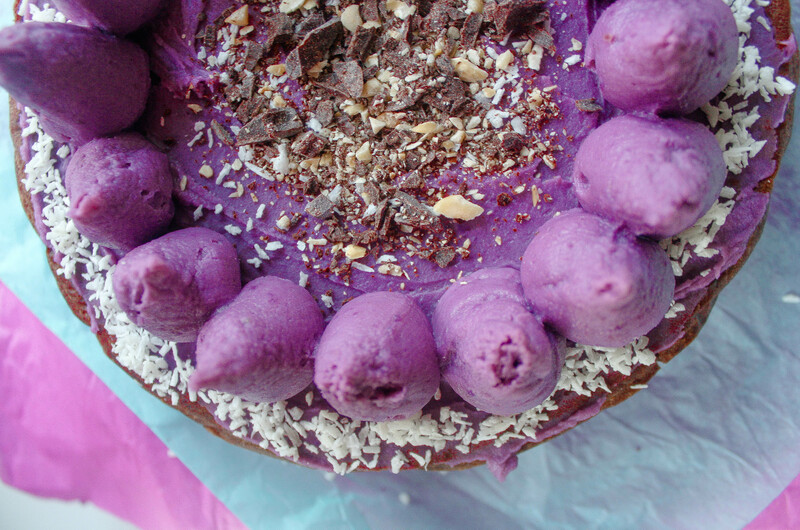 The great thing about this Vegan Chocolate Cake is that we can all have a slice (or two 😉) of it as it is gluten-free, dairy-free and nut-free too … and full of flavours! Get your supply of chocolate ready because this week is the start of the CHOCOLATE WEEK! 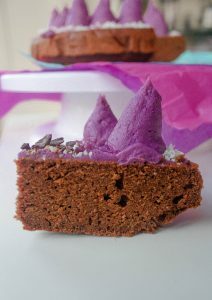 For the occasion I have made a very dense and rich Vegan Chocolate Cake with a delicious purple sweet potato frosting! This recipe is very easy to make and should only take you 15 minutes to prepare! 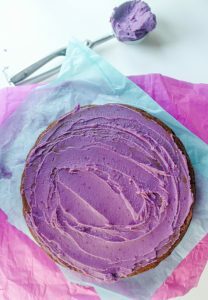 I have kept the amount of sugar relatively low so that it combines perfectly with my favourite Purple Sweet Potato frosting. All I ask for you is to ensure that you get a good quality cocoa powder for a delicious chocolatey flavour! Click this link if you want to find out what a good quality cocoa powder should look like! The main thing to remember is that the higher the percentage of fat the better! I hope you try and like this Vegan Chocolate Cake, if so let me know! Share on Pinterest and tag a photo on Instagram #mimies_delicacies so that I can see your lovely creations as well as helping me reach more of you lovely people! Merci my friends! 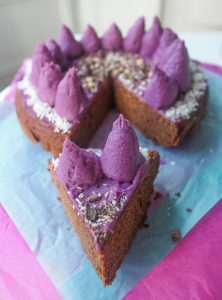 Let’s celebrate Chocolate Week with a slice of this vegan & gluten-free Chocolate Cake topped with a velvety Purple Sweet Potato Frosting! Line your cake pan with the prepared round of parchment paper or simply brush the bottom of your pan with some oil. Cover the ground chia seeds with 5 tbsp. of cold water and let them sit for about 5 minutes. In the meanwhile, sift the rice and cornflour flour in a large bowl (this step prevents any lumps or impurities from going into the batter). Add the baking powder, cocoa powder, cane sugar, salt and whisk. In a separate bowl, stir together the oil, vanilla paste, and dairy-free milk. Add the chia seeds making sure to mix thoroughly as they tend to stick together. Fold the wet mixture over the dry ingredients until evenly mixed. Place in the oven and bake for about 25 minutes. A skewer or a knife should come out clean. Take the cake out of the oven. Cool on a wire rack for 10 minutes and remove from the pan. It is now time to make the frosting! If desired you can also add some shredded coconuts and chocolate chunks in the middle (see picture). 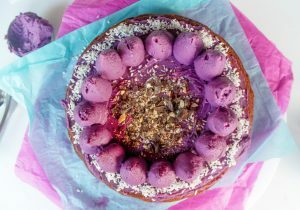 Previous Post: « Dairy-Free Frosting – with Purple Sweet Potato!